Trash room garbage odors are the bane of modern commercial businesses. They are like the residue of unpleasant relatives who remain in house long after the holidays and visiting hours have gone with the wind and other places. Relatives aside, trash room odors are caused by a number of very unpleasant reasons, and they can ruin the impression of any business for the clients they serve, the residents (and guests) they house, the potential buyers they hope to close or any other person you’re trying to impress or keep happy, healthy and far from from malodors. Professional help, such as that provided by the master of all odor control specialists, Air-Scent International, is often needed to effectively deal with the problem. If you’re an air care distributor, building manager, HOA management company, hotel, hospital or any type of business owner that serves the public, read on to discover the most comprehensive, state of the art collection of effective odor neutralizing systems and products or contact our team today to place an order by clicking the dumpster below! 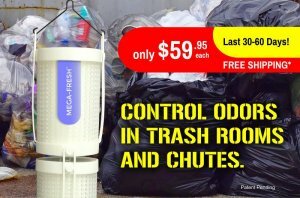 Click to stop dumpster and trash room odors today! 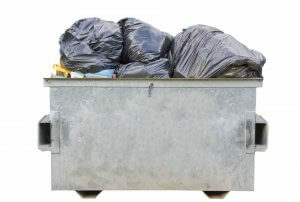 Garbage smells because it contains decaying materials, which can be meat, vegetables or even diapers. The decaying process attracts bacteria that make a meal out of the amino acids in the proteins of the meat. To further this disgusting break down of events, vegetables also rot and they liquefy slowly, while smelly microbes feast on what remains of the vegetable’s cell structure. While these odors are offensive, they are not harmful to humans. However, the rats and flies that are attracted to the rotting garbage pose significant health threats to humans especially if they penetrate food supplies. No matter what your industry, every business under the sun generates trash and garbage that must be regularly eliminated in order to maintain a work place that is clean, safe and healthy. Having the proper equipment, which involves the appropriate size trashcans that are always kept covered and the best odor-control products that money can buy, are important factors in maintaining clean odor controlled trash rooms. In addition, every effective odor-control and management initiative emanates from first establishing a clean trash room. Why Is One Odor-Control Program More Effective Over Others? In an industrial or commercial setting, malodors can be serious concerns that go far beyond the concept of cleanliness and godliness. If fouls smells are the crime, the perpetrator is the presence of bacteria that are left to reproduce either because of infrequent or inferior cleaning procedures or a combination of both. Odors can occur anywhere within a building, but trash rooms, bathrooms, stairwells and break rooms in offices where food is consumed and hastily put away tend to have more problems than others. The main reason some odor-control programs work better than others is simply because some are better than others. Many times, the tendency is for an employer to go for the easiest and least expensive strategy to mask the odors rather than eliminating them. Products used for the former task lack the potency of the latter. Freshening the air, however, no matter how assiduously applied, is always only a temporary solution for the recurring problem of growing bacteria. It is akin to just applying a band-aid on a wound rather than treating it. Masking foul odors can actually worsen the situation by blending with smells that are already present and collectively forming an even more unpleasant malodor. Instead of the short term fix of reducing odors, business owners and managers must get proactive and opt for more efficient methods, which involve the use of special odor-eliminators, which contain molecules that attach themselves to the odor-causing bacteria, in addition to live biological digesters and anti-bacterial cleaning solutions to eradicate them from the ambient air, leaving a fresh scent in their wake. Neutralization of odors allows for a pleasant smelling room and permits any selected product to last longer. For trash rooms, a chosen method should be effective, mild and barely discernable. To eliminate the gram-active bacteria causing the odors in a trash room, a three-pronged approach must be initiated involving cleaning, sanitizing and disinfecting. Outside professionals, such as the ambient air care specialists at Air-Scent, must do more than just cover up the malodor; they must determine its root cause and then treat it accordingly, no matter what size of the room or the stench of the malodor. The trash room of any facility as well as other areas should be subject to consistent inspections and applications to insure that the odor-causing bacteria do not have a chance to breed. Eradicating the source of odors and implementing a customized odor maintenance program ensures an improved, more pleasant business environment for everyone. Bottom line — our products do not mask odors; they destroy them at their molecular level via Metazene®, the most powerful and effective vapor-phase odor neutralizing additive in the marketplace (more on Metazene in a few). It makes perfect sense that the more urbanized and industrialized a country becomes, the more trash it produces. According to Ede Ijjasz-Vasquez, senior director for the World Bank’s Social, Urban, Rural and Resilience Global Practices, every year, the nations of the world produce 1.3 billion tons of waste. The amount of waste generated is expected to double in lower-income African and Asian cities as a result of population growth, urbanization and rising consumption. By the year 2100, that figure is expected to reach up to 4 billion tons. The United States, China, Brazil, Japan and Germany are the leading trash generators. The U.S. alone produces 254 million tons of waste annually (2013 statistic), China, a nation with a population that is four times the size of the United States, is not far behind with a figure of 190 million tons of waste per year. For all countries at all times, waste positively stinks and it can be a real problem to human health and well-being if the proper equipment isn’t employed both in large scale landfills and in residential commercial and industrial settings. Products that neutralize are necessary to truly kill the bacteria and eliminate the trash room odor source. The good news is that there are products on the market today that do all of the above and are manufactured by one highly reputable company. With well over seventy years of on site-experience, laboratory refinements and product development, Air-Scent’s odor-control products are heads above the rest and far exceed industry standards. When it comes to products that effectively eliminate stubborn trash room malodors, the neutralizing agent that is like no other is Metazene®, Every product listed below contain this powerful, molecular odor neutralizing additive. Learn more about Metazene here. Malodors speak a negative language all their own and only one neutralizer addresses them in a way that silences them forever. This dual action colorless additive that neutralizes malodors with a little help from industrial science is the most powerful gram-positive bacteria killer in the world. Its potency is guaranteed because of its methodology, which is to attack bacteria at the molecular level. Metazene has been around for more than seventy years, but early efforts to prepare it were often thwarted by its volatility. It took many years to perfect a concentrate that was stable and pure. Today, products containing Metazene are the answer for all commercial spaces, and industry owners and managers who are constantly waging a war against recurrent malodors in high-traffic areas, particularly trash rooms and public restrooms. The reason why Metazene is the best additive on the market lies in the realm of industrial science. Most odor neutralizers depend upon surface contact enzymes and anti-bacterial agents to produce a microbial action that will eliminate foul odors. While this does occur on a limited level, microbial agents are completely ineffectual when it comes to residual or vaporous odors. It is a matter of weight and chemical reaction; chemicals bond with foul odor molecules, which are lighter in weight, and alter their electron configurations. The following six products, when used individually or collectively represent the most comprehensive and effective arsenal to combat trash room and dumpster odors in any commercial setting. This odor-control system is highly effective for waste containers and dumpsters, garbage collection trucks, trash can containers and compactors in kennels and farms, food processing plants, restaurants, hotels, hospitals, nursing homes and taverns. This Air-Scent system is extremely efficient in controlling malodors arising from decomposing fish, seafood, poultry, and meat and grease by-products. It contains a timed, automatic spray system which applies Garbo Fresh concentrate into trash compactors, trash chutes and open garbage bins. No connection to Miss Greta Garbo of silent screen fame and her common request to be left alone, this neutralizing concentrate works best when used in company with the Automatic Dumpster Control system (Auto D.O.C.) mentioned above. It is one of the most effective odor-fighter concentrates in the industry. 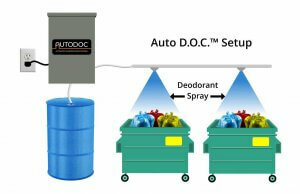 It works instantly upon application, freshening dumpsters and compactors and providing long lasting odor-control. This product also destroys those odors that attract rodents and flies. The patent-pending MegaFresh™ modular diffuser system works in a whole new way to control odors and freshen air in condominium and apartment trash rooms, as well as the trash chutes on the floors above where its hung. It’s 100% active odor-fighting formula has no moving parts and provides worry-free performance for 30-60 days. Simply hang MegaFresh™ in the trash room to control odors, and the MegaFresh™ “chimney effect” freshens the air in the trash chutes on the floors above. Use one or link several of them together to provide additional coverage. Each MegaFresh™ cartridge is designed not to drip, leak or spill when oriented in any position and contains a 100% active proprietary formula to eliminate odors. It also eliminates the use of potentially harmful paradichlorobenzene hanging blocks. The Megafresh refill can also be placed within our Aroma Beam low-voltage, blue tooth operated fan air diffuser system, which can be mounted on any wall and provides fully effective dispersion of odor neutralizing components. Scientifically formulated for heavy-duty applications, a little Scatter goes a long way to eradicate heavy, powerful odors emanating from trash containers, garbage dumpsters and compactors. These granule odor-combating pellets can handle the toughest odors in many diverse locations including: restaurants, institutional and municipal waste facilities; landfill sites; sewage and treatment plants; refuse trucks and trash room incinerators. The power of those granules lies in Metazene. They provide long lasting odor-control and are perfect for warm weather applications. They are manually applied into empty dumpsters initially and several times daily at the dumpsters accumulate trash. They can be applied on oozing liquids found on floors. It also contains citronella, which works as a deterrent for flies. In an emergency situation, powerful absorption is the most important feature for any product addressing water-based spills. Zorb-It-All does this as well as simultaneously controlling trash room odors. It is manually applied to spills, leaks, oozing dumpsters and other liquid spills and puddles, and instantly turns the liquids into a gel which can easily be swept up and placed within the dumpster for disposal. Trash rooms and compactors in almost any type of facility such as hospitals, nursing homes, and industrial plants, just to name a few, can greatly benefit from this product. Zorb-It-All is available in several sizes to suit every application, and is also extremely effective for use on bodily fluids and waste, as upon application, it immediately solidifies all water-borne human and animal bodily fluids including blood, urine and vomit. It eliminates odors, deodorizes surfaces and is easy to use and highly effective on carpeting and hard surfaces. This incredibly potent biological digester concentrate contains over 200 billion live bacterial cultures per gallon. The enormous density of non-pathogenic, live cultures produces enzymes that quickly break down all types of organic wastes. The Enz-O-Matic™ also provides instant odor control and pleasant fragrance to freshen the air. This odor-neutralizer contains a unique mix of special liquid-affecting agents (emulsifiers) that almost as if by magical means, immediately introduces odor control and pleasing aromas that freshen ambient air. This product manually applied via a pump sprayer or automated spray systems, and is perfect for a wide variety of applications including: septic systems, floor drains, drain lines, grease trap and organic stains. We have been providing solutions for ambient air care since our inception in 1946 when Bob Surloff invented the World’s first fan-operated air freshener and named it Air-Scent. The rest is aromatic history that has endured across seven decades of impeccable service and expanded into additional superior products that surpass even the toughest of industry standards. The creation of deodorizers, air freshener diffuser machines and totally effective odor-control products is our sole focus and our fine application equipment and highly effective performance refills are the best available in the world today. As a world leader in the manufacturing of odor-control and air care products for every application under the sun, our specialty is prescription treatments™ for the eradication of difficult target malodors. There are no more effective odor-control solutions for persistent trash room odors than the fine, proven and highly effective products offered by Air-Scent and our distributors. All of our products are created in our unique, state-of-the-art 80,000 square foot technology center situated in the heart of Pittsburgh. Our expert staff of scientists, researchers and chemists are equipped with the most innovative equipment available for the study of industrial science including: mass spectrometry, distillation, extraction and quality control technology, head space analysis and gas chromatography. All products are also field-tested and perfected within our on-site sensory-testing center. So to wrap this smelly dive into your dumpsters and trash rooms — odors that emanate from either of them require heavy duty, special attention that only a top-notch company such as Air-Scent can offer. Call us today. We are there to help eradicate foul trash from your business environment forever.